Here are my fave useful & sustainable containers for bringing to work and storing food - in the pantry, fridge, and freezer! If someone is just getting started with meal prep what are the essentials they need? What will they use them for and why are these your picks? Make single servings: A good way to control portions is to buy single-serving packages of food. This may be a little more wasteful, but it’s more convenient. If you have the patience and self-control to make your own single-serving packages, even better! Foods that are great to buy in single-serving packages are guacamole packets, string cheese, nuts, and nut butters. 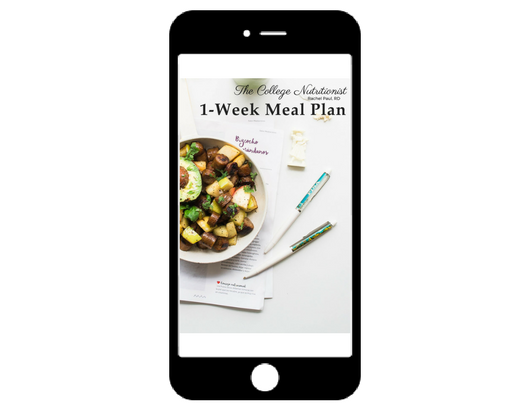 Be realistic about how often you will eat out: When creating your meal plan, try to be realistic about how often you will eat out. If chicken & veggies just isn’t going to cut it on Friday night, don’t even plan (and buy groceries) to last you that long. You will end up SAVING money in the end when you plan for what is realistic in your life! Buy certain foods in bulk: Especially once you get the hang of meal prepping and shopping for yourself, buy certain foods in bulk that you know you’ll get through. I typically recommend these foods you buy in bulk if you can - e.g. at the grocery store or at bigger stores like CostCo. These foods last a long time - which is important especially if you’re only cooking for yourself. Packs of nuts like peanuts, cashews, etc. (or better yet get a variety!) - if you want to make your own little packs, go ahead by all means! For me, it’s worth it to buy the pre-packaged packs because I’m lazy (I’m sure some of you can relate!)! Jerky - lasts for so long! So what do we want in containers? Ability to go from the freezer, to the fridge, to the microwave, etc. SO! With all of that being said, here are my favorite containers. I prefer 2-compartment so you don’t feel so stressed to fill up every section with a different food :) And I love the lock lids to prevent spilling. These aren’t perfect though - make sure they’re stacked vertically in your lunch bag and don’t carry at any kind of angle. I think I have 10 of these I’m not joking 😂 They are SO handy because they’re so big, they can go from the freezer to the fridge, they can go in the stove (without the lid), etc. My absolute favorite! At this point I don’t use any other storage containers besides these. These aren’t 100% leak-proof, but they’re pretty good! Pack them in your insulated lunch bag. ALSO! These actually aren’t dishwasher safe so just wash them by hand. Thermoses are excellent for non-spillage and keeping foods hot - especially helpful if you’re somewhere without a microwave! Here are my faves - so cute AND insulated! This one is much more expensive, but, also, SO CUTE!